Ferre Milano designer leather belts are a wardrobe staple. 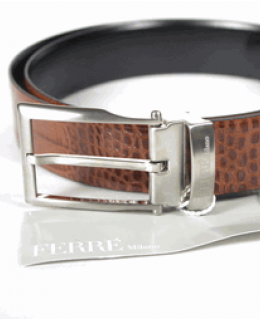 This Ferre Milano reversible leather belt is Italian made. Light brown crocodile leather and black smooth leather on reverse side. Silver buckle with Ferre Milano logo. One size. Trim leather for a perfect fit. Made in Italy.